After going down against the Boston Bruins early, the Toronto Maple Leafs spent a majority of Game 1 (so far) effectively defending seemingly every scoring opportunity their opponents got. The Leafs have now gotten to the point where they’ve been able to turn that strong defense into some magical offense. The best example of this game plan came late in the second period. 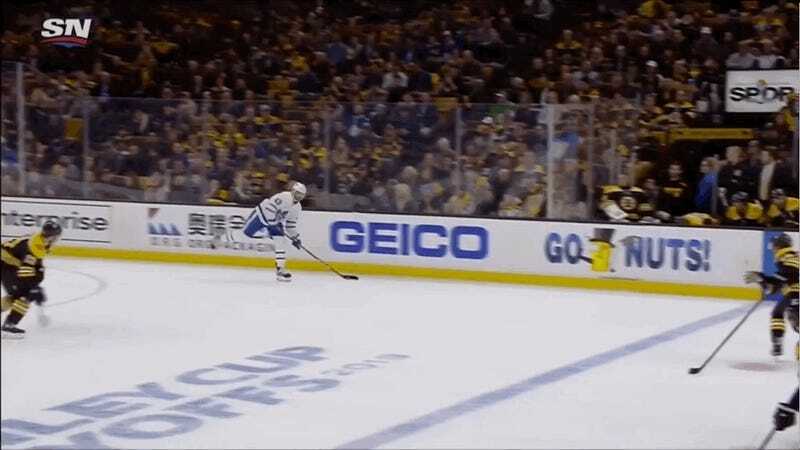 Bruins defenseman Matt Grzelcyk went for a quick pass to his teammate near the goal, much to the chagrin of the home crowd, and sent the puck straight to a cluster of players. After some jostling, the puck found its way to Nazem Kadri, who sent an insanely accurate pass across the ice to streaking Swede William Nylander. The 22-year-old then found the tiniest of creases in Tuukka Rask’s five hole to slot in the shot for a goal. The goal gave Toronto a 3-1 lead over Boston which means Leafs fans everywhere can relax. I mean, when has a 3-1 lead ever been a problem in hockey before?